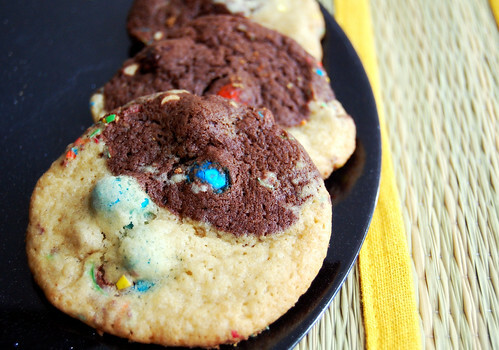 Half chocolate cookies, half peanut butter cookies with chopped peanut butter M&M's. Preheat oven to 350 degrees F. Grease cookie sheets using preferred method. In a medium sized mixing bowl, sift together 2 1/2 cups flour, baking soda and salt. In a large mixing bowl, using a mixer on medium speed, beat together butter, peanut butter, sugar and granulated sugar until creamy, about 2 minutes. Beat in eggs and vanilla until well combined. Reduce mixer speed to low and gradually beat in flour mixture until combined. Divide dough into two bowls. 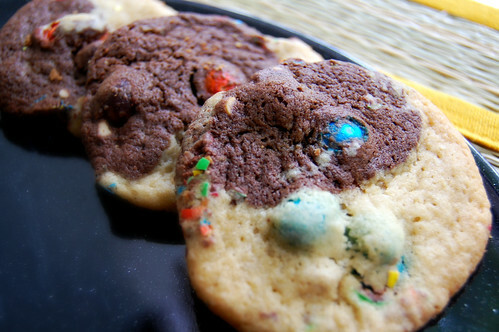 In one bowl, beat in additional 1/4 cup flour until combined; stir in 1/2 cup M&M's. In additional bowl, beat in cocoa powder until combined; stir in 1/2 cup M&M's. Lightly cover dough and chill in the refrigerator or freezer until firm, about 15 minutes. Form dough into two balls, shape into logs, and wrap in separate pieces of plastic wrap; chill for 10 minutes. Place additional 1/2 cup peanut M&M's in a plastic bag and crush with a rolling pin. Remove cookie dough logs from freezer, press together, and roll into crushed M&M's to coat the outside. Cut log in half, wrap logs in plastic wrap, and chill for 10 additional minutes. Slice logs into 1/2-inch thick rounds, place on cookie sheets, and bake for 14-15 minutes, or until golden brown around edges. Cool 1 minute before transferring to wire racks to cool completely. 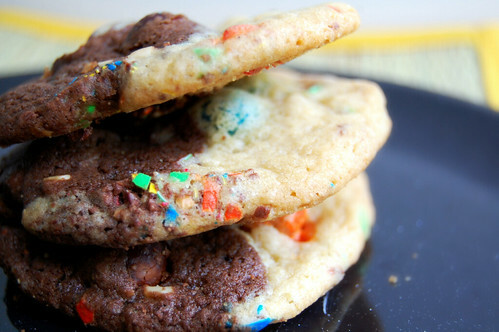 22 comments on "Chocolate-Peanut Butter Peanut M&M Cookies"
My head is spinning just LOOKING at those luscious cookies - so mesmerizing. girl you keep making those cookies no matter how messy your hair is. Okay, seriously? I have already bookmarked pretty much every recipe you've posted. You're killing me! I need to take a week off work and do nothing but bake cookies. I love cookie week and peanut m&ms! Looks super! I'm sure these would disappear so quickly on a dessert table or cookie exchange. Delicious. Why choose between chocolate and pb cookies when you can have both? When it comes to M&Ms, I'm wild for the almond ones, but they're not always easy to find. more cookies? they look amazing!! Love love love this. I'm making these for my hubby! These are his favorite flavors... and I don't make nearly enough cookies :). Can't go wrong with M&Ms! These are indeed beautiful - so much packed into these gorgeous cookies. Sweet dreams! my daugter loves M&Ms. She will love this! These look so fantastic! I agree, peanut M&Ms are the best, but peanut butter come in a close second. 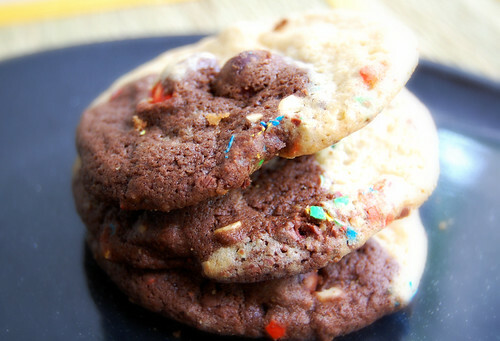 Can't wait to see more cookies, if they look and sound as great as these then my diet is in trouble! What a fun one! Peanut M&M's are dangerous for me. These are so cute- I love the light and dark halves!!! Naps on the couch always make me feel so groggy when I wake up but they always seem like such a good idea at the time!! I was just about to go to a movie theater and thank god I checked your blog beforehand, because I was honestly thinking of seeing one of those movies! Guess I'll see District 9 instead. I saw an interview with the main guy from 500 days of Summer and he just seemed so darn proud of how awesome the movie was...wah wah, sorry dude. and the cookies look fantastic, I wish I had some for District 9. These look great, I love the difference in color dark and light. I love peanut m&m's instead of peanut, but lets face it I don't eat them otherwise I would be bigger! I'm crossing my fingers... This is the first time i've made homemade cookies so i'm super nervous i did it wrong. They are in the oven now and look beautiful. I got confused on the shape I was supposed to cut them to... was i supposed to ball them or keep them flat? I hope my fiance loves them! I found this recipe last night and made them. They were delicious. Thank you for posting it!